← Welp, Thor: Ragnarok Looks Amazing! 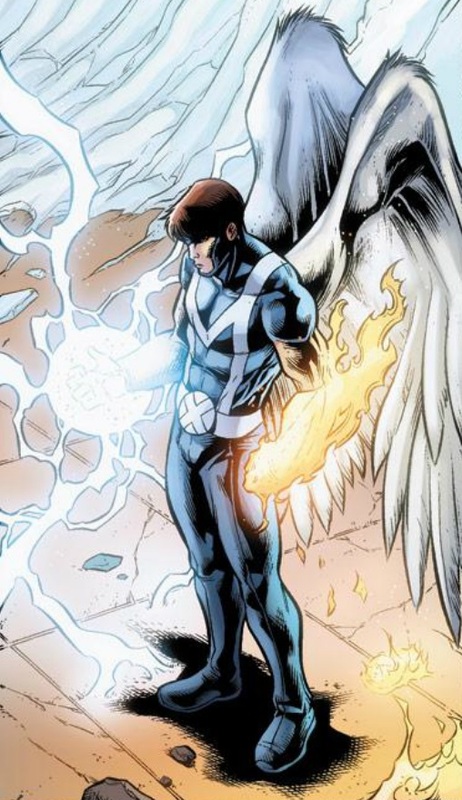 The 6 Best Comic Book Characters with ALL THE POWERS (of one specific team)! Forgive the all-CAPS shouting in the headline, but what better way to describe this list of characters? This is a list of comic book villains who combine all the powers of a specific super team. I’m not just talking about power mimics or power thieves, either. I’m not talking about your Rogues or your Peter Petrellis or your Synchs or your Absorbency Lads. These are characters who, for whatever reason, limit themselves to copying the super-powers of just one group. Maybe they were built by a mad scientist to oppose a specific super team. Maybe they have a magical power and just decided to focus on one group. 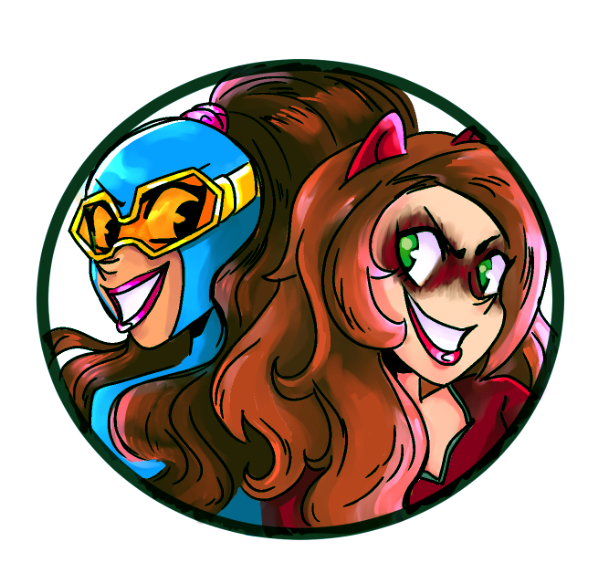 Maybe they’ve got a super weapon that combines the powers of all the other super weapons in the comic. Whatever the case may be, these guys have one specific power set in their battles against one specific super group. It’s kind of a pigeon-holed role, but everybody needs a gimmick. So join me after the jump for six comic book characters who possess all the powers of one specific super team! Dazzle in the specificity! The newest villain on this list might just be one of the most powerful! 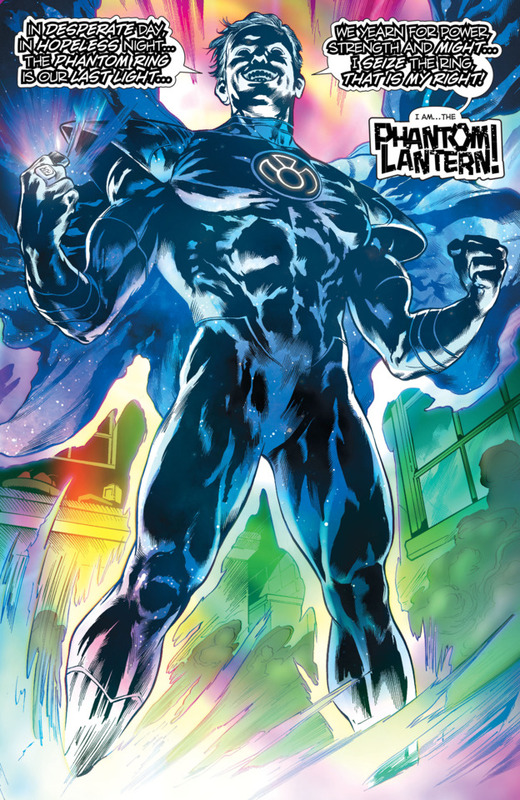 A couple years ago, DC Comics introduced the idea that the Green Lantern Corps are only one part of a large spectrum of emotion-based colored lanterns. You had your Red Lanterns, your Orange Lanterns, your Blue Lanterns, your Star Sapphires and so on. Great idea. And how do you expand on that? 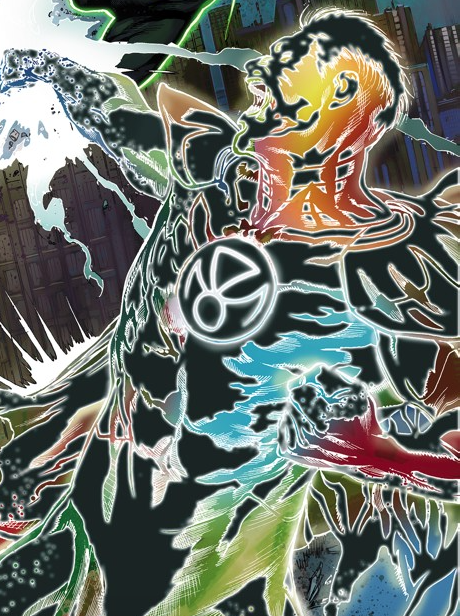 By introducing a villain who has the powers of all the Lantern Corps combined! The Phantom Ring was invented by a rogue Guardian to combine all of the emotions, and he was exiled into space just long enough that the Phantom Ring would make sense when it showed up. Imagine if the Green Lanterns had discovered the Phantom Ring before they’d discovered the other colored Lantern Corps? Egg on their face! Anyway, the Phantom Ring came to Earth and was grabbed by a dork named Frank Laminski. This guy was a total loser who was obsessed with becoming a Green Lantern, but he didn’t have the chutzpah. Fortunately for him, the Phantom Ring can be worn by anybody. They don’t have to ‘overcome great fear’ or any other stipulation like the other rings. So ol’Frank could just grab the Phantom Ring, pop it on his finger and become one of the most powerful beings in the universe! Frank, being a twerp, couldn’t handle all that power and ended up going on an emotional roller coaster breakdown. The ring eventually zeroed in on the compassion of the Indigo Lanterns and Frank was able to convince himself to take it off, ending his crazy threat. 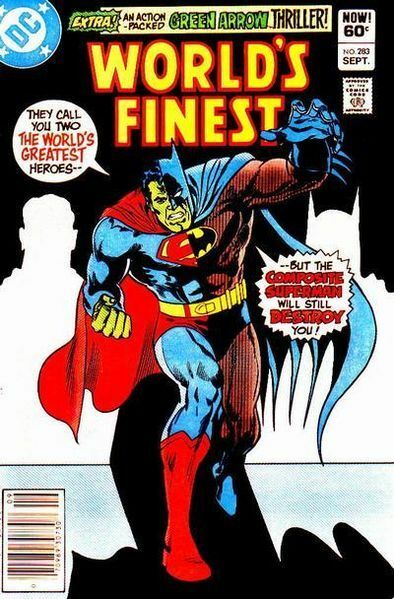 Surprisingly, despite all appearances, Composite Superman does not possess the powers of Superman and Batman. Instead, he has the powers of Superman and the Legion of Superheroes. I have no idea why Batman was added to the mix, other than the fact that Batman is Batman. If you can latch on to even a little bit of Batman’s awesomeness, go for it! Unsurprisingly, Composite Superman has an insane origin story. Joseph Meach was a loser who tried to pull off a big accident to gain some notoriety, but Superman showed up to prevent the accident and save his life. Feeling bad for the guy, Superman then got Meach a job as janitor in the Superman Museum, which only fueled his bitterness towards the Man of Steel. Then while he was sweeping up a section of the museum devoted to the Legion of Superheroes, Meach was struck by a bolt of lightning and gained all of the powers of the Legion…through their mannequins. Madness! So Composite Superman had the powers of Colossal Boy, Shrinking Violet, Lightning Lad, Sun Boy, Triplicate Girl, Invisible Kid, Chameleon Boy, Brainiac 5 and even Matter-Eater Lad! This guy had it all! And he uses it to menace Superman and Batman a couple of times. He used Chameleon Boy’s shapeshifting abilities to make him into the green-skinned half-and-half version of Batman and Superman, because apparently none of the Legion powers he absorbed gave him any sort of fashion sense. Composite Superman would go on to get rebooted a couple times, as is the way of comics. He eventually got turned into Composite Man, a direct adversary of the Legion who copied all their powers. I could have put Composite Man on this list, but I couldn’t pass up the insanity of Composite Superman. I’m only human. He’s a mighty green robot with all of the powers of the Avengers! So much so, that he often looks like the Avengers, complete with Hawkeye’s silly mask right in the middle of his big, dumb robot face! Built by the evil scientists at A.I.M., the Super Adaptoid was a one-off bad guy way back in the 1960s who had a sliver of Cosmic Cube inside of him. He copies the powers of the Avengers of the time: Captain America, Goliath, Hawkeye and Wasp, and does little else. He’d pop up now and again in the standard villain role, sometimes taking on the X-Men and sometimes taking on Captain Marvel and whoever else anybody else ever felt he could elsewise threaten. Chance are we probably won’t see him in any upcoming Avengers movies. For the better. Look out, Batman! That muscly leprechaun took his shirt off! Apparently it is super easy to install extreme super-powers into robots. 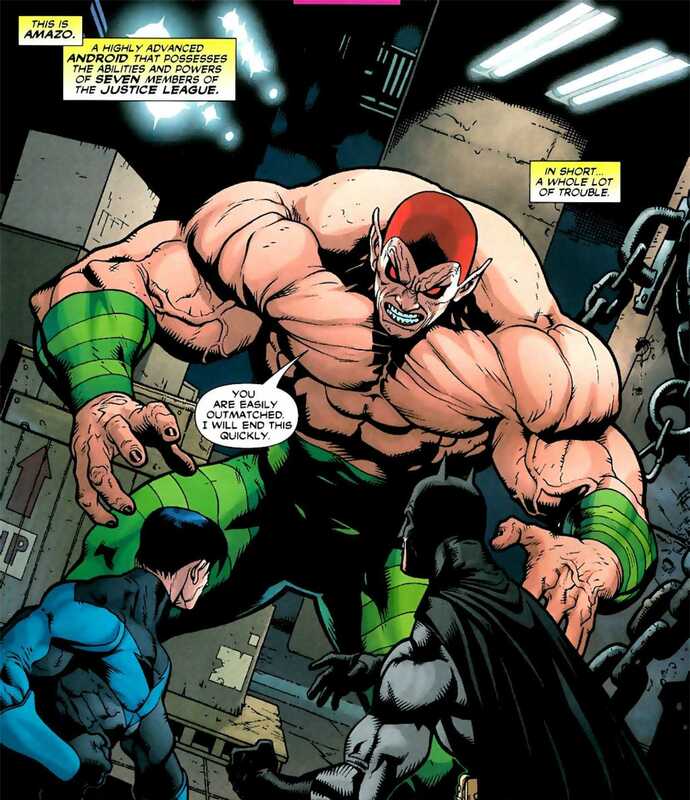 Amazo is an android built by Professor Ivo to combat the Justice League. Ivo is one of two famous robot-inventing scientists at DC Comics, and is also the one with the apparent worse fashion sense. How does that look inspire anything but giggles? Amazo started out with the powers of the original Justice League: Green Lantern, Flash, Martian Manhunter, Wonder Woman and Aquaman, but would go on to just grab any Leaguer’s powers that it wanted. Combine Flash’s speed with Superman’s everything? Sure, why not? Duplicate the extensive cosmic power of Green Lantern’s ring? Yep! Much like his brother from another publisher, Super Adaptoid, Amazo would pop up now and again to challenge the Justice League in whatever random adventure that came along. He even sort of survived the transition into the New 52, though modern writers always try to muck him up a bit. It’s not important. And he’s not very important. Quick bit of comic book trivia for you! Out of all the numerous new mutants who have joined the X-Men over the years, who is the first ever “new” member of the X-Men after the original five? It’s the Mimic, the guy who copied all their powers! Calvin Rankin was an all-American jerk whose father just happened to be a mad scientist, and his experiments somehow infused Calvin with the power to mimic the skills, talents and super-powers of anybody around him. Then, by pure happenstance, Cal ended up bumping into some of the X-Men and copying their super-powers. 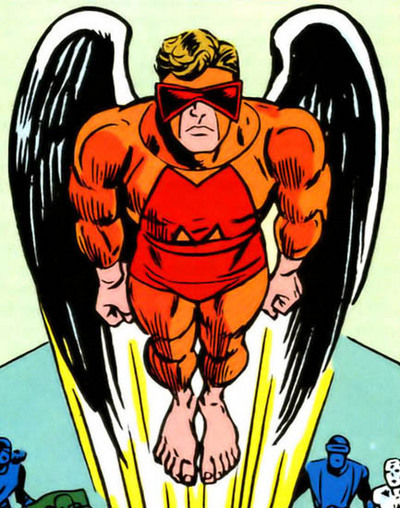 Desperate for more of that awesome super-powered fun, Cal made a costume for himself and tracked the X-Men to their mansion, where he copied all of their powers and attacked. But the twist is that, when Calvin came back a second time, he wanted to join the X-Men! He bullied himself on the team and was their first-ever new member, beyond the original five. That’s a pretty baller move — except that he only lasted three issues before losing his powers and being kicked off the team. Mimic popped up here and there for decades until he was brought back for good in the ’90s, this time having permanently mimicked the powers of the original X-Men. How did this happen since he’d been off the team for several years? Comics never said, but it looks damn cool! Along with growing a gnarly beard, Calvin fought X-Force, teamed up with Onslaught, joined the Brotherhood and was eventually tricked into joining the Dark X-Men to once again battle his original enemies. Fortunately after that, Calvin re-joined the good guys and is currently on the straight and narrow. All it cost him was his beard. The Skrulls are a race of aliens with nearly unlimited shape-shifting abilities, and yet they choose to look like green gremlins with chins that would make a Star Trek makeup artist proud. 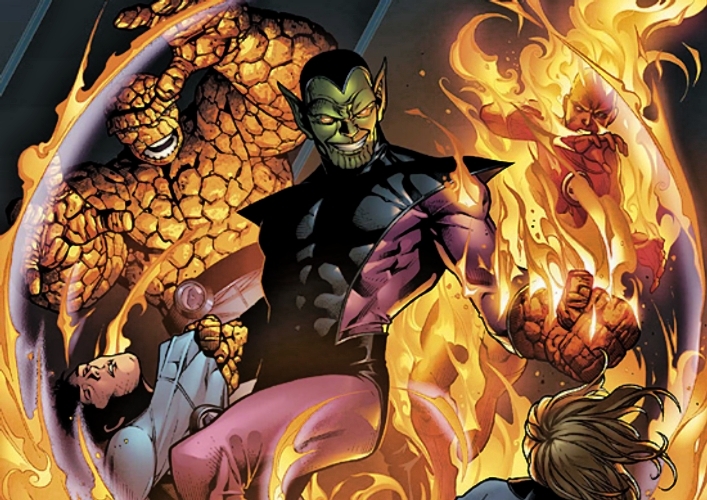 They started out as enemies of the Fantastic Four, and in order to combat these lovable heroes, the Skrulls created a Super Skrull with all of the powers of the Fantastic Four. Makes sense, right? 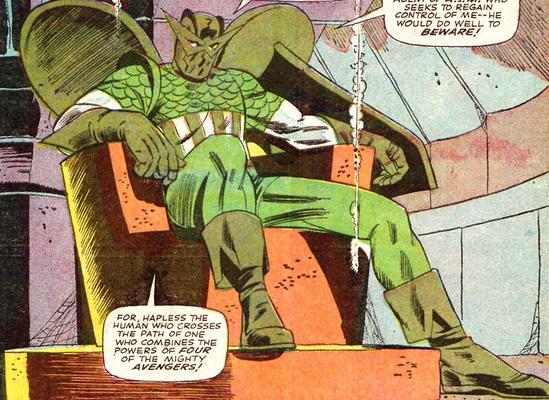 Also, does this make him the Skrull equivalent of Superman? Kl’rt was an ordinary Skrull soldier who was recruited to be the new super agent, and he spent a ton of time bothering both the Fantastic Four and other heroes at Marvel. He played a big role in the Kree-Skrull War, has fought pretty much everybody, and even got an event built around him called Secret Invasion. The Skrulls invaded Earth by posing as superheroes, and when the crap hit the fan and it was time for a big battle, the Skrulls introduced a veritable army of Super Skrulls with the combined powers of pretty much everybody! But in that battle, Kl’rt had switched sides and become a good guy! 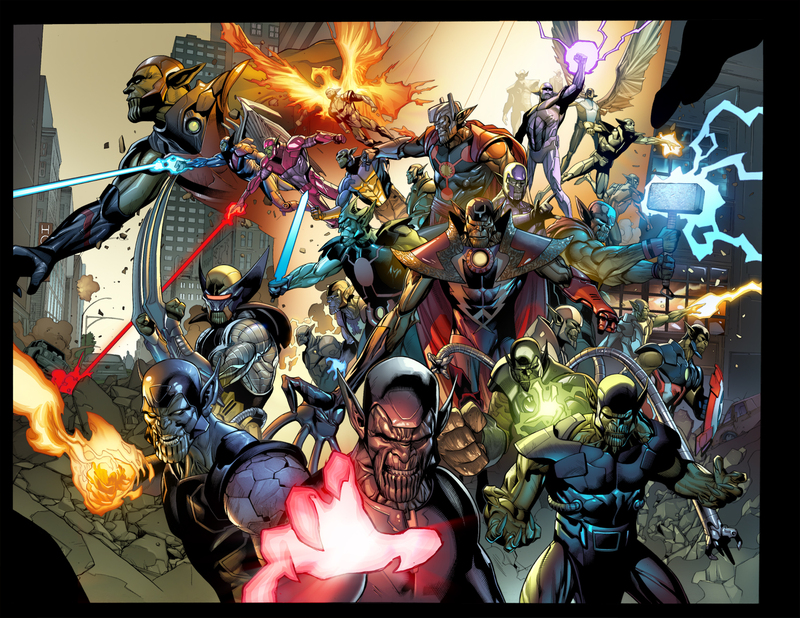 During Annihilation, arguably Marvel’s best Big Event of the past two decades, Super Skrull joined with the cosmic heroes to repel an invasion from the Negative Zone, and he stuck with them during that story’s sequel. Kl’rt went on to keep aiding Earth’s heroes against his own people during both Secret Invasion and Infinity, and I do believe he is now the leader of the new Skrull Empire. So even if you start out as a bad guy picking on the Fantastic Four, you too can do the right thing and eventually be crowned king. Posted on April 12, 2017, in Comics, DC, Lists of Six!, Marvel, Superman, X-Men and tagged Mimic, The Mimic. Bookmark the permalink. Leave a comment.